On May 5, 1984, James Bourk left home between 4:00-4:30 AM to go to work. 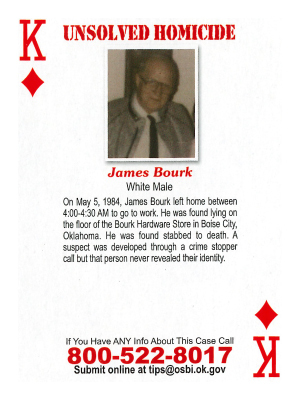 He was found lying on the floor of the Bourk Hardware Store in Boise City, Oklahoma. He was found stabbed to death. A suspect was developed through a crime stopper call but that person never revealed their identity.